Description: A boy has to decide whether to squish an ant, or not. He is persuaded by friends and the perspective of the ant itself. Why I like this book: A good story to clearly show perspective taking. It also leads to great discussion in social groups across the ages. Act out the story. One person be the boy and the other the ant. If you’re in a group- there are friends as well. Switch roles. While acting out, practice tone of voice and body language. How would the ant look, feel, sound like if he was about to be squished? A great story to pair with “Braidy” through Mindwing Concepts. 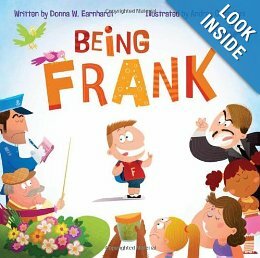 Use to retell the story from different perspectives (boys, ants, friends). Can create thinking and speaking bubbles to pair with the story where necessary. 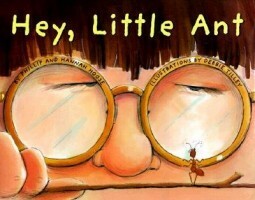 A great story for discussion with older kids about “early peer pressure” (as the friends want him to squish the ant). Could also pair to introduce with Michelle Garcia Winner’s Social Behavior Maps to show how behaviors have consequences for yourself and others. Use for writing. Do compare and contrasting paragraphs with a graphic organizer and/or venn diagram. What the same about the boy and the ant? What’s different? Could pair with curriculum topics about insects, protecting species, etc. Description: A little bunny decides that he wants to run away from his mother. However, she won’t allow it, and finds a way to always follow him wherever his imagination takes him. 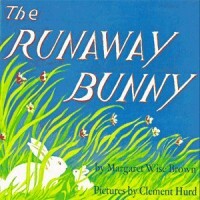 Why I like this book: Most children can relate to strong message of love and commitment of the mother bunny. A great story to model “why”/”because”: Why does the mother follow the bunny? Why did she want to be a fisherman? Why did she want to be a mountain climber? etc. Read the story to the child, without showing the colorful picture scene. See if they can visualize ( (great to pair with the Visualizing and Verbalizing program)- What do they envision? Have them draw what they picture. For example, the circus- Help them develop the scene: what would they see (clowns, crowds), hear (lions roar), smell (popcorn), etc. Use the pictures, and have students “retell” the story. Encourage temporal markers (first, next, then after that). Can make boardmaker pictures to go along, and have students sequence and then re-tell. Please support books4all and order this book from Amazon. Thank you! 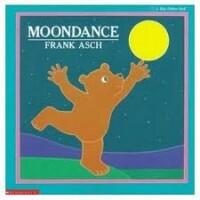 Description: Bear has a wish to dance with the moon. Before his wish comes true, he learns a little bit about weather and a lot about friendship. Why I like this story: It is a classic, it is very sweet, and it can be read and discussed at a number of different levels. Bird is a wonderful role model of a supportive friend throughout this story. His encouragement of Bear to consider alternatives comes up often. He helps Bear find alternative dance partners and he offers Bear another perspective when Bear feels left behind. Following the reading of this book, discuss Bear’s reactions to Bird suggestions and follow up with a discussion of how thinking flexibly is important. The simple story line offers a great opportunity to introduce Braidy, the Story Grammar Marker from Mindwing Concepts. 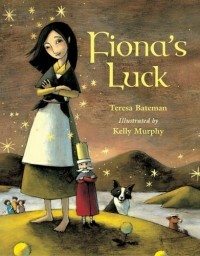 Description: In this Irish folktale, Fiona uses her smarts to trick a selfish Leprachaun king who has taken all the luck of the land. Identify the Story Grammar Elements (characters, setting, etc.). I use with Mindwingconcepts “Braidy.” Multiple “kick-offs,” etc. Teach/discuss similes and metaphors. Great for reasoning. What do you think the simile means? Have students create their own similes and metaphors. 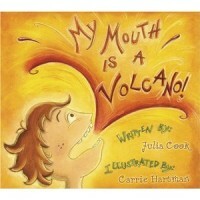 Book: My Mouth Is a Volcano! Description: Louis is a “blurter” and constantly interrupting others and speaking when he should listen or raise his hand. His mother comes up with a simple strategy to help limit his volcanic eruptions. Why I like this book: The story is told from the perspective of Louis, the “erupter”, and is presented in an understanding, realistic light. Children easily relate to this story and are therefore, more willing to work on solving the “problem”. Good book to read to a group or classroom of kids to identify the problem. 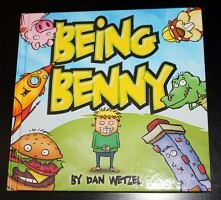 The kids will laugh through the first reading at the entertaining illustrations. As you read the book a second time, discuss how each character is feeling, (e.g. teacher, Louis, classmates, other interrupters). Use thinking bubbles and speaking bubbles to help. Engage kids in a discussion about how they feel when they are interrupted. Many kids talk about their fear of forgetting what they want to say if they don’t “blurt” it out. Work on strategies with them to help them remember. Remind kiddos to wait for a “pause,” raise a hand, etc. Address the physical wiggling, jumping up, and sounds kids make when they interrupt. Provide sensory and motor activities to help their bodies remain calm (e.g. deep breathing, move-‘n-sit cushion, squeeze ball). 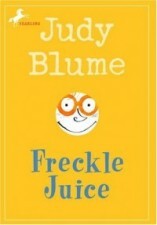 Description: A short chapter book in which Andrew Marcus really wants freckles and can and does do almost anything to try and get them. Why I like this book: The chapters are short and broken up with pictures which makes it more enjoyable and manageable for struggling readers, or those with shorter attention spans. 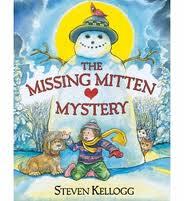 The story is humorous and loved by all kids. Working on summarizing of each chapter. Have children write/share in 2-3 sentences the “most important thing” that happened.